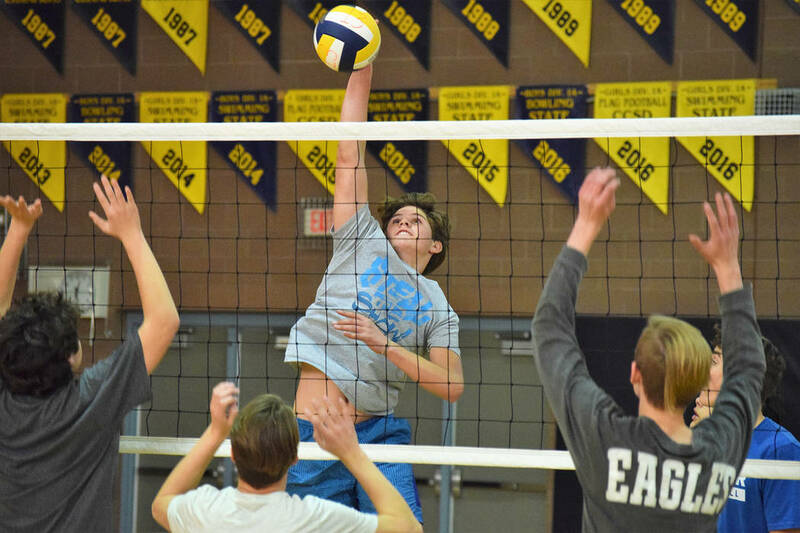 Moving into the varsity ranks this season, Boulder City High School volleyball coach Joshua Fisher and assistant Rachelle Huxford are pleased with the progress the program has made in year two. Robert Vendettoli/Boulder City Review Boulder City High School sophomore Boen Huxford leaps for a net-clearing spike during practice Tuesday. After attempting to grow the program organically with a freshman-only team last season, the Eagles, who play an independent schedule, are on the verge of fielding both a varsity and junior varsity team this season. If they are successful at fielding both rosters, the program’s likely probation period would come to an end at the conclusion of the season, giving them the opportunity to join the 3A classification next season. Returning nine of their 10 players from last season headlined by sophomores Boen Huxford, Preston Jorgensen, Austin Morris and Braeden Soileau, Fisher said he has already seen improvement from his team that went 18-7 in freshman play last season. Going as far as to say he thinks the Eagles would be a playoff team this season had they been allowed to play in the 3A, Fisher is hopeful the participation numbers continue to rise in order to get the chance. “I’ll be happy if we can field two teams after Saturday’s tryout,” he said. “Ecstatic if we can fill all three. Moving forward we want to be a full-fledged program so we can be in the playoffs. Using this season as an independent program to get their feet wet on the varsity level, the Eagles have made their schedule as tough as possible, laden with mostly 4A programs. Facing off against eight 4A playoff teams from last season — Coronado, Desert Oasis, Eldorado, Foothill, Green Valley, Las Vegas, Rancho and Silverado — the Eagles have created a regular season gauntlet for themselves, but that’s the only way they feel they’ll get better. “We’re very excited about the start of the regular season,” Boen Huxford said. “We’re excited to play a bunch of great teams and see how we do against them and what we can work on.